Martin Luther proposed an academic discussion of indulgences when he posted his 95 Theses on 31 October 1517. Myth now says that on that day 500 years ago, he nailed those 95 Theses to the door of All Saints’ Church in Wittenberg, although in reality Luther had sent them to the Archishop of Mainz in an effort to stimulate debate. 2, Martin Luther is unlikely to have nailed his 95 Theses to the door of the Schlosskirche (Castle Church) in Wittenberg on 31 October 1517. In reality, he may have simply dispatched them to the Archbishop of Mainz by courier. 3, Luther may not have expected much of a response, because the powers of the Archbishop of Mainz were extremely limited in Wittenberg. both the Elector’s All Hallows’ Foundation (tomorrow, 1 November, is the Feast of All Saints) and the parish church had held papal privileges since 1400, and these were extended to the university on its foundation in 1502. 4, Martin Luther (1483-1546) was born in Eisleben, Saxony, on 10 November 1483 and was named Martin because he was baptised the bext day, 11 November, the Feast of Saint Martin of Tours. His father’s Hans Luder (or Ludher), and he only later spelt his name Luther; his mother’s name Margarethe Lindemann. 5, Luther grew up in a Church in which calls for reform were already a commonplace. In 1512, Pope Julius II summoned the Fifth Lateran Council, which continued until 1517. This was, in part, a reaction to what the Pope saw as the illegitimate Council of Pisa of 1511, which had been called by the King of France. 6, Throughout the Western Church at the time, many bishops were also trying to reform their dioceses. 7, Luther was not the first reformer to emphasise the importance of preaching. Many mayors and city councils were appointing preachers, often Augustinian, Franciscan and Dominican friars, who were instructed to deliver sermons in the language of the people. 9, Luther joined the Augustinian order as a friar on 17 July 1505, was ordained in 1507 at the age of 24, and completed his doctorate in Wittenberg in 1512. During that time, he also visited Rome in 1510, and had his ‘Tower Experience’ (Turmerlebnis) which was a major changing moment in his life. 10, Luther wrote his 95 Theses in Latin, the language of academia and the Church. They could be read only by the educated clergy and by those who had received a Latin education. 11, A German translation of the 95 Theses was not made until Christmas 1517, when they were translated by a Nuremberg city councillor, Kaspar Nützel. 12, Luther’s subsequent decision to begin writing in German led to a string of pastoral works in 1518-1519, including explications of the Ten Commandments and the Lord’s Prayer, an instruction on Confession, and a series of ‘sermons’ or short treatises on Baptism, the Eucharist, Penance, and Marriage. 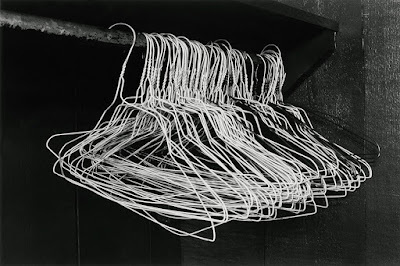 These were short, accessible works that could be read by those who were literate, and read aloud to those who were not. 13, Much of what is accepted as Lutheran theology, including the Augsburg Confession, is actually the work of Luther’s more intellectual contemporary Philip Melanchthon (1497-1560). 14, Luther was willing to exaggerate, if not lie, about the Papacy. In Rome in the Middle Ages, unwanted infants were passed into the hospital at the Church of Santo Spirito in Sassia through a revolving, barrel-like door, the rota. When Martin Luther visited the hospital in 1511, he was shocked by what he saw. But he exaggerated the reports he heard and claimed the unwanted babies were the Pope’s own children. 15, Luther’s theological insights are often summarised in the ‘Three Solas’ or the ‘Five Solas’: Sola Scriptura (the Bible alone); Sola Fide (Faith alone); and Sola Gratia (Grace alone). To these, some add Solo Christo (‘through Christ alone’) and Soli Deo Gloria (‘to the glory of God alone’). 16, The ‘Three Solas’ were not identified systematically until the 20th century, and the ‘Five Solas’ are not listed together until 1965. 17, Luther gave primacy to Scripture, but does not ignore tradition. He had a very full grasp of Patristic writings. He chose Scripture over innovation that has no Scriptural foundation. 18, Luther was not innovative, and is not setting up a new Church. He stands in a long line of tradition that includes Francis of Assisi and the Brothers of the Common Life. 19, Luther retained sacramental confession. 20, Luther rejected Transubstantiation, but it was not defined in the present understanding until the 13th session of the Council of Trent in 1551, more than five years after Luther’s death. 21, Luther accepted the concept of ‘Real Presence’ and that the Eucharist is genuine participation in the life of Christ. There were other definitions and understandings of ‘Real Presence’ and they are held to this day, for example, within the Eastern Orthodox Church, without being considered heretical by Rome. 23, In the Large Catechism, Luther says: If a hundred thousand devils, together with all fanatics, should rush forward, crying, How can bread and wine be the body and blood of Christ? etc., I know that all spirits and scholars together are not as wise as is the Divine Majesty in His little finger. Now here stands the Word of Christ: Take, eat; this is My body; Drink ye all of it; this is the new testament in My blood, etc. Here we abide, and would like to see those who will constitute themselves His masters, and make it different from what He has spoken. It is true, indeed, that if you take away the Word or regard it without the words, you have nothing but mere bread and wine. But if the words remain with them, as they shall and must, then, in virtue of the same, it is truly the body and blood of Christ. For as the lips of Christ say and speak, so it is, as He can never lie or deceive. 24, But Luther moves the Eucharist from being a ritual action passively observed to a genuine participation by all present. 25, Luther emphasises the holiness of the everyday life of work, family and citizenship. 26, The Church has always been in a state of being reformed, although the principle of ecclesia semper reformanda, which has been attributed not to the Reformers but to Saint Augustine, is not one of Luther’s sayings. It was used only for the first time by Karl Barth in 1947, and then adapted by Hans Küng in the 1960s. 27, One early reformer was Pope Gregory the Great, one of the Doctors of the Church, who reformed the liturgy and structures of the Western and sent Saint Augustine on his mission to England. 28, From the mid-14th century, John Wycliffe and the Lollards were demanding Reform, and William Tyndale, who worked on an early translation of the Bible, was executed before the Anglican Reformation began. 29, In England, from the mid-14th century, the Lollards were demanding Reform under the leadership of John Wycliffe. He was a contemporary of Julian of Norwich, an early champion of women’s voices in the Church. Although she lived and wrote a century before Luther and Calvin, she may be seen as an early forerunner of the Anglican Reformation. 30, William Tyndale, who worked on an early translation of the Bible, was executed before the Reformation began. His prominence in Protestant folklore sometimes eclipses the influence of Desiderius Erasmus. 31, Long before Luther is said to have nailed his theses to the door of the Church in Wittenberg in 1517, Desiderius Erasmus was at Queens’ College, Cambridge. There between 1511 and 1514, Erasmus translated his new Greek and Latin versions of the New Testament that would inspire the kind of Bible study that created an interest in Luther’s writings and theology. 32, Erasmus remained a Roman Catholic priest, but through his work on the Greek New Testament in Cambridge while he was Professor of Divinity, he made the Bible accessible to the Anglican Reformers and he helped to stimulate an interest in Luther’s work. 33, Luther’s marriage to Katharina von Bora, a former nun, challenged clerical celibacy but also gave him six children. That marriage to a nun and a Roman Catholic would deny him membership if he applied to join many later Protestant organisations. 34, Until Luther, Faith was understood not as individual assent but as the Faith delivered to the apostles, preserved in the Church and expressed in the Creeds. But his emphasis on individual faith, conscience and interpretation made an insightful contribution to the Enlightenment. 35, The locus classicus of Luther’s doctrine of salvation by faith alone is found in the ‘Introduction’ he wrote to Saint Paul’s Letter to the Romans, as part of Luther’s famous translation of the Bible of 1522. 37, Luther did not see eye-to-eye with many other Reformers. 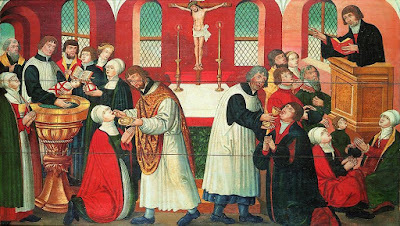 When Luther and Zwingli met at the Marburg Colloquy, they agreed on many points of doctrine, but they did not reach an accord on the doctrine of the Real Presence of Christ in the Eucharist. 38, The most cogent critique of Luther came from King Henry VIII. For his tract Assertio Septem Sacramentum (A Defence of the Seven Sacraments), written in 1520, Henry VIII was honoured by Pope Leo X with the title Fidei Defensor, Defender of the Faith, on 11 October 1521. 39, Prompted by Christian II, the exiled king of Denmark, Luther sent a letter of apology to Henry VIII in September 1525. But a royal letter of ridicule and rebuke followed 10 months later. By 1527, however, Henry’s views were changing. He wanted a male heir and also wanted to marry Anne Boleyn in the hope that she would become the mother of a male heir. 40, Luther concluded that the king was bound under pain of eternal damnation to retain the wife he had married. But the divorce issue was settled for Henry in 1533 when Thomas Cranmer, Archbishop of Canterbury, dissolved the marriage to Catherine of Aragon and declared the king lawfully married to Anne Boleyn. 41, In 1521, the Archbishop of Canterbury received complaints that Oxford was infested with Lutheranism. But Cambridge became the nursery of the English Reformation, and many of the English reformers and some of the early martyrs were students and scholars there. 43, A future bishop in the Church of Ireland was among the Cambridge scholars who met at the White House. They included Thomas Cranmer, future Archbishop of Canterbury, Miles Coverdale, translator of the Bible into English, Matthew Parker, later Archbishop of Canterbury, William Tyndale, Bible translator, the martyr Hugh Latimer, and John Bale, later Bishop of Ossory. 44, Thomas Cranmer (1489-1556) was six years Luther’s junior, and was martyred 10 years after Luther’s death. As a student in Cambridge, Erasmus was one of his favourite authors, but it was Luther who drew his attention to the Scriptures. 45, Hans Holbein’s painting of the Ambassadors (1533) shows the ambassadors at the court of Henry VIII standing on the floor mosaic of Westminster Abbey, with not one but two globes, and Luther’s Book of Psalms. 46, Luther rejected the centuries-old consensus on the canon of Scripture. He relegated many canonical books of the Old Testament to the Apocrypha, and tried to remove Hebrews, James, Jude and Revelation from the New Testament because they challenged his views on Sola Gratia and Sola Fide. 47, Luther’s followers rejected these proposals, but they changed the order of the books, which remain last in the German-language Luther Bible. It should be asked whether Luther tried to shape the Bible to fit his theology rather than allowing the Bible to shape his theology? 48, Luther’s translation of the Bible was completed in 1534. It helped to standardise the modern German language, was a landmark in German literature and contributed to shaping German cultural and national identity. 49, Martin Luther’s Marian theology was developed out of the deep Marian devotion he experienced in his childhood and in his training for the priesthood. Later, it became an integral part of his theology and piety. 50, Luther asserted dogmatically what he considered firmly established biblical doctrines, including the divine motherhood of Virgin Mary and held to what were then pious opinions about the Immaculate Conception and the perpetual virginity of Mary, although they only became dogmatic teachings of the Roman Catholic Church as recently as the 19th and 20th centuries. 51, But Luther also taught that all doctrine and piety should exalt and not diminish the person and work of Jesus Christ. He emphasised that the Virgin Mary was a recipient of God’s love and favour, but could not see her as a mediatrix of intercession or redemption. 52, Luther accepted the Marian decrees of the ecumenical councils and the dogmas of the Church, and held to the belief that the Virgin Mary was a perpetual virgin. 53, Luther accepted the then-popular view of the Immaculate Conception, over three centuries before Pope Pius IX declared it a dogma in 1854, and he believed in the Virgin Mary’s life-long sinlessness. 54, Although Luther pointed out that the Bible says nothing about the Assumption of Mary, he believed that Virgin Mary and the saints live on after death. 55, In his Commentary on the Magnificat (1521), Luther extolled the magnitude of God’s grace towards the Virgin Mary and her own legacy of Christian instruction and example demonstrated in this canticle of praise. 56, Luther wrote a number of pious poems that focus on the Virgin Mary’s virginity, and translated into German old devotional Latin hymns about her. 58, Throughout his life, Luther called the Virgin Mary by the title Theotokos, Mother of God. He believed that as Christ was conceived in the womb of the Virgin Mary and was ‘born of the Virgin Mary,’ then she is the Theotokos, the God-bearer. 59, Luther’s cultural legacy is also found in the arts, including church architecture, painting and music. The altar pieces in Wittenberg and Weimar are among the great works by Lucas Cranach (1472-1553), who also painted the best-known portrait of Luther. His contemporaries included Matthias Grünewald (1470-1528) and Albrecht Dürer (1471-1528). 60, Luther was a singer, lute player and prolific hymn-writer. His best-known hymn is ‘A mighty fortress is our God,’ and many of his hymns were set to music later by Johann Sebastian Bach (1685-1750). 61, Luther wrote several hymns, and it could be said he inaugurated congregational singing in church. 62, One ugly, unacceptable side of Luther is his antisemitism. His virulent anti-Jewish writings helped shape German, European and Christian expressions of anti-Semitism. 63, Luther’s language in On the Jews and Their Lies (1543) is vile as he claims the Jews are full of the ‘devil’s faeces ... which they wallow in like swine.’ He calls for synagogues and schools to be set on fire, homes razed, prayer books destroyed, rabbis forbidden to preach, property and money confiscated. 68, Later, in Of the Unknowable Name and the Generations of Christ, he uses ugly imagery as he equates Jews with the Devil. 69, Luther’s views informed the foundation for Nazi attacks on Jews in the 1930s and 1940s. The historian Diarmaid MacCulloch says Luther provided a blueprint for the Kristallnacht, when Lutheran bishops applauded the burning of synagogues on Luther’s birthday, 10 November 1938. Bishop Martin Sasse of Thuringia and many other bishops, pastors and theologians used Luther’s writings to call for a ‘de-Judaised’ form of Christianity and to justify early Nazi measures against the Jews. 70, On the other hand, one of the towering figures of the 20th century was Dietrich Bonhoeffer (1906-1945), the Lutheran theologian who died in a concentration camp for his resistance to Hitler and the Nazis. 71, Luther was also a misogynist and he condoned polygamy based on his interpretation of the practice of the patriarchs in the Old Testament. 72, The Lutheran influence that was dominant in the early Reformation in England diminished during the reign of Edward VI, when England became a haven for religious refugees, including Martin Bucer from Strasburg, who had once tried to bring Luther and Zwingli together and who influenced Calvin’s doctrine of the Lord’s Supper. 73, Archbishop Thomas Cranmer invited Melanchthon and Calvin to England for a conference to discuss a united confession. But that conference never took place. The Lutherans were unfriendly to these exiles because of their denial of the real presence, and the heirs of exiles were among the later Puritans rather than among the Anglicans. 74,Thomas Cranmer drew on Lutheran catechisms, litanies, and liturgies as he compiled the Book of Common Prayer. 75, The 39 Articles were strongly influenced by phrases and sentences in the Augsburg Confession, and the Lutheran imprint is impressed on the Book of Common Prayer and the Anglican form of liturgy and worship to this day. 76, Since 1930, there has been full communion between the (Lutheran) Church of Sweden and the member churches of the Anglican Communion. The contacts maintained by Bonhoeffer and Bishop George Bell through Swedish mediation laid the foundations for the World Council of Churches. 77, Today, there is full communion between the Anglican churches in Europe and the Episcopal Lutheran churches through the Porvoo Communion, which brings together 15 churches. There are similar agreements in the US and Canada. 79, ‘True Christians participate in all the blessings of Christ and the church, and this is granted to them by God even without indulgence letters,’ Luther wrote (Thesis 37). Such letters, he wrote, ‘are nets with which one fishes for the wealth of people’ (Thesis 66). In 1567, Pope Pius V abolished the sale of indulgences. 80, Many of the later divisive dogmas were not key issues at the Reformation, including the Immaculate Conception (1854), Papal Infallibility (1870) and the Assumption (1950). 81, In 1999, the Lutheran World Federation and the Roman Catholic Church issued the Joint Declaration on the Doctrine of Justification, agreeing on Justification and lifting Roman Catholic anathemas that once applied to Lutherans. The declaration followed earlier affirmations of a shared, common faith, including the declaration on the Eucharist (1978). 82, Pope Francis recently spoke favourably about the process of dialogue, although there is still some way to go before the divisions of the past five centuries are healed. 83, Martin Luther’s reforms initially attracted widespread popular sympathy, but ultimately his success and the continuation of his ideas were guaranteed because of the support of secular princes and city magistrates. 85, In 2015, a ‘Declaration on the Way to Unity’ identified 32 issues on which Roman Catholics and Lutherans are approaching convergence. 86, A year ago, on 31 October 2016, Lutheran and Roman Catholic leaders held a joint ecumenical prayer service in Sweden, launching this year-long commemoration of the Reformation. Both continue to hope for an agreement that is going to allow Lutherans and Roman Catholics to celebrate Communion together. 87, Lutheran leaders have approached the Reformation anniversary with humility. ‘We’ve had to say that breaking up the western church was not a gift to the church,’ says the Bishop Elizabeth Eaton, Presiding Bishop of the Evangelical Lutheran Church in America, the largest of the Lutheran denominations. 88, There are still deep divisions within Lutheranism. Neither the Missouri Synod nor the Wisconsin Synod, for example, are yet willing to invite those who do not share all their beliefs, including other Lutherans, to share Communion. 89, Luther shaped the German language. His German Bible is for the German language what Chaucer, Shakespeare and the King James Bible are for English, or what Dante is for Italian. 90, Luther’s writings triggered wars and civil turmoil and wars throughout Europe. But he died in his own bed early on the morning of 18 February 1546, and was buried beneath the pulpit in the Castle Church in Wittenberg. 91, Although the Edict of Worms condemned Luther as a heretic, he escaped death as a heretic. Which just goes to shows how complex interaction between political and religious motives shaped and enabled the Reformation. 92, Unlike most scholars of his time, Luther was both interested in and knowledgeable about the technology of printing. He knew the economics of the business, cared about the aesthetics and presentation of books and understood the importance of what we now call brand-building. 93, Luther and theology aside, we could say the Reformation caused more than a religious rift. It has been said recently that through the world’s first ‘viral’ media campaign, the Reformation also transformed architecture, sparked the notion of secular democracy, and began to empower women in the Church. 95, Luther suffered from constant, chronic constipation. Legend says he was inspired to write his 95 theses while seated comfortably on the chamber pot. That cannot be confirmed, but in 2004 archaeologists discovered Luther’s lavatory, which was remarkably modern for its day, featuring a heated-floor system and a primitive drain. 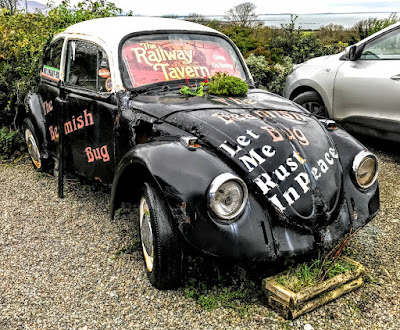 On the road from Dublin to Askeaton at the end of last week, two of us stopped for lunch at Matt the Thresher in Birdhill, one of the best-known gastropubs in Ireland. At one time, a huge volume of traffic passed through on the village on the N7. Now the village is at a junction on the R445 (formerly the N7), about 20 km from Limerick City, and close to the M7, just two minutes off exit 27. The M7 has diverted much of that traffic from Birdhill, making it a quiet and tranquil village. The hills to the south-west stretch down to the banks of River Shannon, surrounded by woods and grassland, meadows and stonewalls, streams and rivers, with a rich variety of wildlife and views of Lough Derg. 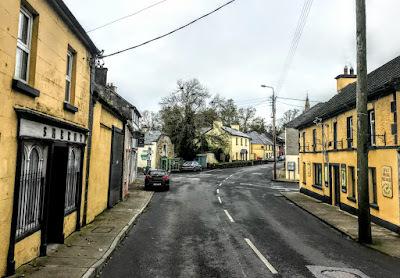 Birdhill was named the ‘Tidiest Village’ in the Tidy Towns Awards in 2007, 2008, 2016 and again in 2017, and the village also took the overall award this year and was named Ireland’s ‘Tidiest Town.’ But when it was named this year, it stirred a humorous conversation on one radio chatshow about tidy towns, tidy villages and tidy crossroads. 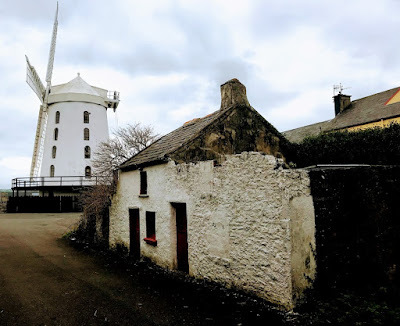 Birdhill (Cnocán an Éin Fhinn, the Little Hill of the Fair Bird) is a small and picturesque village between Limerick and Nenagh, 5 km from Killaloe to the north, and 7 or 8 km from Newport to its south. 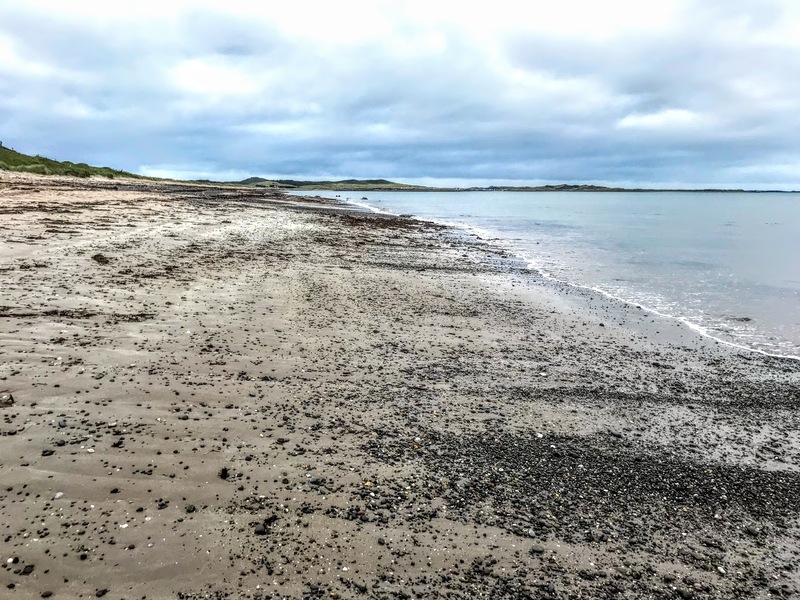 Birdhill takes its name from a mythical encounter between Oisín of the Fianna and a giant bird that was causing widespread destruction in the area. Birdhill is in the Barony of Owney and Arra, between Lower Ormond to the north, whose principal town is Cloghjordan, and Upper Ormond to the east, whose principal town is Nenagh. The village uses as its motto ‘For the sake of the little village,’ words spoken by Matt the Thresher in Charles Kickham’s book Knocknagow. 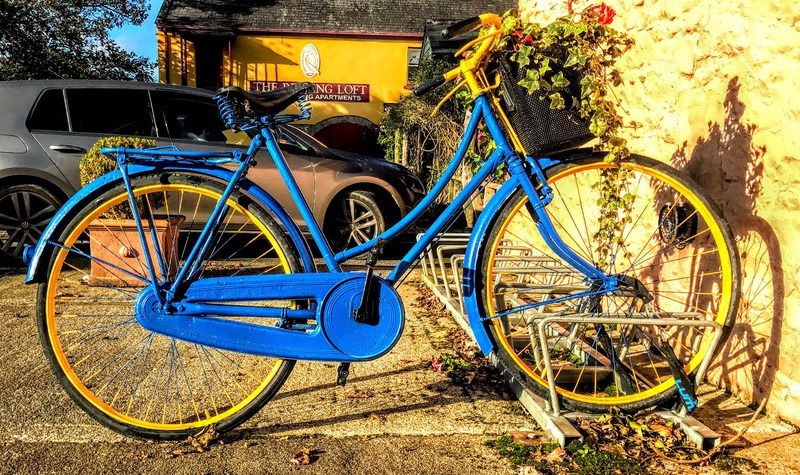 Matt the Thresher has been providing award-winning food under the family-run team of Ted and Kay Moynihan since 1987, and was the perfect place to stop for a bite to eat. It was voted Best Gastro Pub 2010. The building is an attractive component of the local streetscape due to its location, form and massing. Its stepped roofline and decorative detail such as the bargeboards and windows add interest. This detached multi-phase house was built around 1890 and the first vintner’s licence for the premises was granted in 1891 to Martin Hassett, who also ran a general provisions and light hardware store from the building, as well as a bakery, a taxi service, and Birdhill’s first post office. The bar and grocery business was continued by Martin Hassett’s daughter, Mary Anne Bradshaw – better known as ‘Babe’ – from 1927 to 1964. But the premises closed in the second half of the 1960s, and Babe died in 1972. Meanwhile, her brother Bill Hassett has been running a bicycle repair shop nearby until he died the following year. The pub was refurbished and reopened in 1975 by the Crowe family from Broad Street, Limerick, who renamed it the Old Pike. In 1978, the licence was transferred to Peter Laffey. In 1985, the premises were bought by Tony Ryan of GPA (Guinness Peat Aviation) and Ryanair. He carried out major renovations on the pub, and reopened it as an ‘olde worlde’ style gastropub with the name Matt the Thresher after the character in Charles Kickham’s Knocknagow. Initially, the pub was managed by Denis O’Brien, Tony Ryan’s personal assistant. In 1987, it was acquired by Ted and Kay Moynihan, who developed it into a popular restaurant and bar. The business changed management in 2016, and is now run by the Moynihan and Lyons families. This is a four-bay, two-storey block with gablets to the first floor and a canted bay window to the ground floor, with a slightly-higher single-bay block to west end with a shopfront. It is connected to a three-bay, two-storey former coach house by a seven-bay single-storey block. There are pitched slate roofs with carved timber bargeboards to the gablets and rendered chimneystacks and rendered walls. Throughout the building, there are timber sash windows, and there is a timber battened front entrance door. 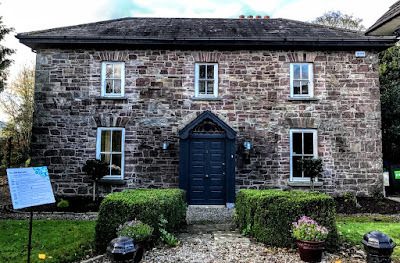 Nearby, the Old Barracks is a detached three-bay, two-storey former RIC barracks built around 1820, although a nearby plaque says it was first built around 1720 as a home for retired nurses. The barracks building was one of several founded by Bloomfield, who built four police barracks at Birdhill, Newport, Lackabrack, and Foilduff, all on the perimeter of his estate, on the four points of the compass. The building is significant because of its connection to Lord Bloomfield, who owned the nearby Ciamaltha House. The Bloomfield family first settled at Eyre Court, Co Galway, in the early 18th century. Benjamin Bloomfield of Eyre Court had three sons: John, ancestor of the Redwood family, Co Tipperary; Joseph; and Benjamin, ancestor of the Barons Bloomfield. In 1742, John Bloomfield of Redwood married Jane Jocelyn and their grandson, John Colpoys Bloomfield, married Frances Arabella, daughter and co heir of Sir John Caldwell, Baronet, of Castle Caldwell, Co Fermanagh. In 1851, the estate of John Colpoys Bloomfield of Castle Caldwell, amounting to 1,977 acres in Co Tipperary, was bought by William Hort and George Armstrong for almost £13,000. Benjamin Bloomfield (1768-1846) of Newport, Co Tipperary, fought as an army officer at Vinegar Hill in Enniscorthy, Co Wexford, during the 1798 Rising. Later, he was MP for Plymouth and became private secretary to George IV, earning his reputation for trying to curb the excess spending by the king in the early 19th century. In 1825 he was given the title of Lord Bloomfield. His son, John Bloomfield, the 2nd Lord Bloomfield, was British ambassador to Berlin. His mistress, the Sweidh actress Emilie Sophie Högquist (1812-1846), later became the mistress of King Oscar I of Sweden. After Lord Bloomfield died in 1879, his estate of almost 10,000 acres was inherited by his sister, the Hon Harriett Mary Anne Kingscote of Gloucestershire. Later in the 19th century, the Old Barracks served as accommodation for servants of the Twiss family, and from 1905 to 1923 it was Buckley’s provision and grocery store. It then returned to police use and served as a garda station from 1927 to 1962, with living quarters, a cell, a day room, an interview room and a store. When the garda station closed, the house became a family home for a number of families, including the Spain, Moran, Sheridan and McDermott families. It was bought in 1985 by Tony Ryan of GPA and Ryanair, who planned to use as part of an extension of Matt the Thresher. In 1990, the building was refurbished under the guidance of the architect Sam Stephenson, and it opened a year later as the Tipperary Trading Company to showcase Tipperary-made products. In 1998, it became a retail outlet for Tipperary Crystal. The house was bought by Browsers Furniture in 2003, and they sold home and garden furniture from here for the next decade. The building was leased to the Coffee Culture Trading Academy in 2015, and the surrounding grounds have been made available as a community allotment for growing herbs and vegetables. Here is a conundrum or a puzzle for this unusual Bank Holiday weekend. 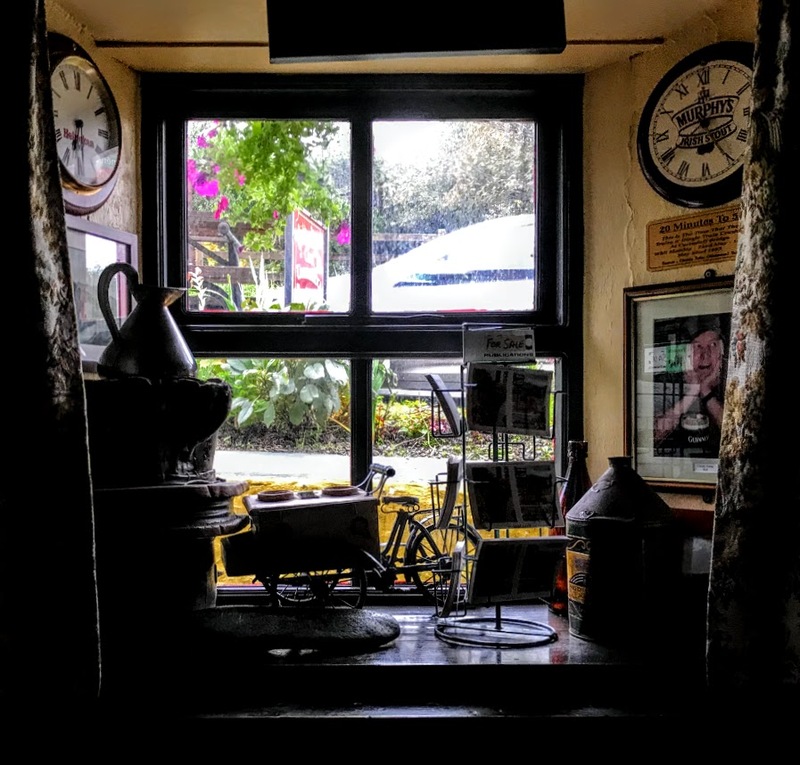 Which pub is the oldest pub in Limerick City? It’s a question for historians and Limerick residents alike. The Locke Bar on 3 George’s Quay is a gastro pub that claims to be on the site of one of Limerick’s oldest pubs, dating back to 1724. The pub is on a prominent corner beside the banks of the Abbey River, on a tree-lined quay, a few doors away from both Barrington’s Hospital and across the street from Saint Mary’s Cathedral. It is just a few steps away from King John’s Castle and the Hunt Museum. This ‘olde world’ pub has old wood panelling and open fires. At lunch time it is popular with barristers and solicitors from the courts nearby, but it is equally popular with tourists in the evening and is known for its live music. Because the Locke Bar is so close to I have Saint Mary’s Cathedral, I have often enjoyed lunch there. 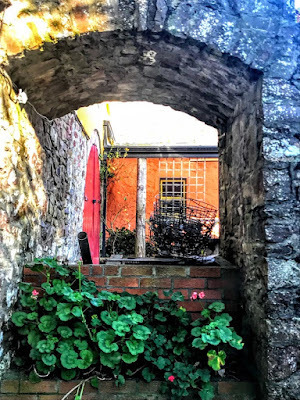 But is it the oldest pub in Limerick City? Although the Locke Bar is on the site of a pub that opened in 1724, some Limerick people who challenge its claims say it has been opened for about 20 years as the Locke Bar, and that this does not make it the city’s oldest pub. That approach to definition would rule out many pubs from similar claims. 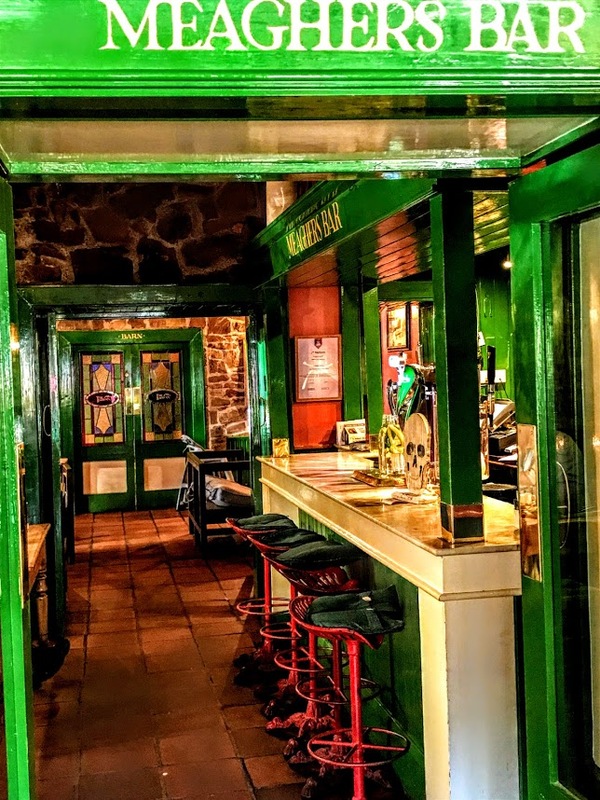 After all, the Guinness Book of Records says Ireland’s oldest pub is Sean’s Bar in Athlone. Not only is this not its original name, but it’s not even the original ninth century building, and by no stretch of the imagination could Sean’s Bar have remained in the same family, continuing the same business tradition. Recently, on a number of social media platforms, the Locke Bar sent congratulations to Tony and Grainne who opening Katie Daly’s Heritage Pub and Kitchen last month at 12 The Parade, on the corner with Convent Square where Nicholas Street arrives in front of King John’s Castle. 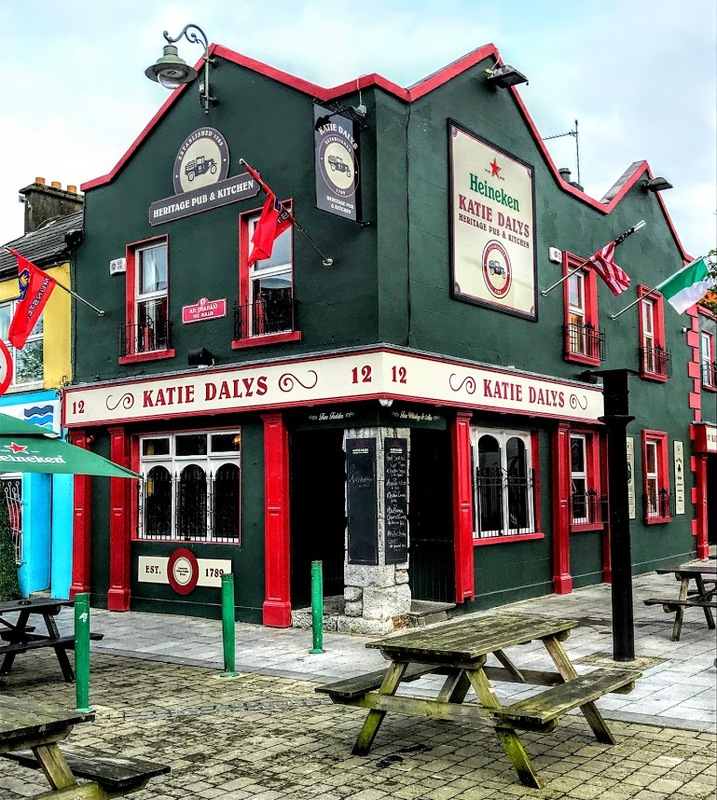 But the name Katie Daly’s is modern by today’s standards, and the pub itself claims, modestly, to date from 1789, making it 65 years younger that the Locke Bar by any of the standards that might be used to date the age of a pub. Then, there are those who say JJ Bowles at 8 Thomond Gate is the oldest pub in Limerick. 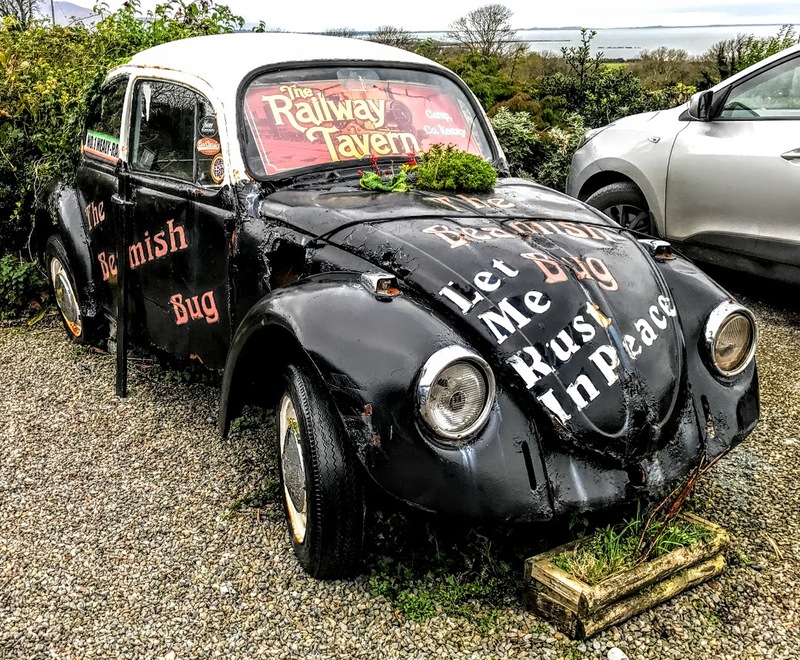 This is a great rugby pub, only seven minutes’ walk and shouting distance from Thomond Park, with a riverside beer garden. The pub is beloved by Munster rugby fans. But it seems to date from 1794, making it five years younger than Katie Daly’s and much younger than the Locke Bar, although its defenders are quick to point out that the building claims to date back to the 1600s. 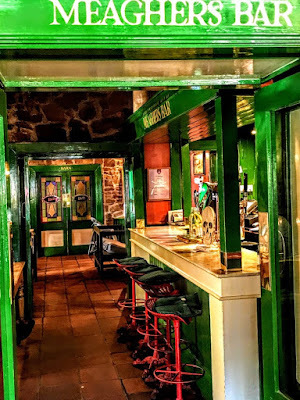 If the discussion is about the oldest pub in Limerick, should the discussion be confined to Englishtown and Irishtown? If the boundaries are extended, then how far can we go? After all, Durty Nelly’s in Bunratty was opened in 1620. But that’s not in the city. So which pub is Limerick’s oldest pub? 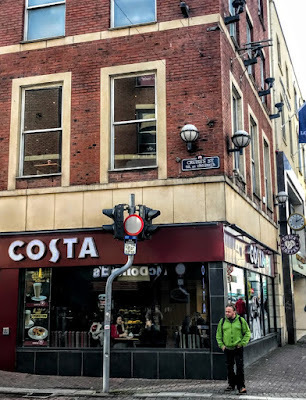 I was writing yesterday of how the English Radical politician John Bright and his friend, the London-born American financier George Peabody regularly stopped in Cruise’s Royal Hotel in Limerick on their way to Castleconnell for their fishing trips. 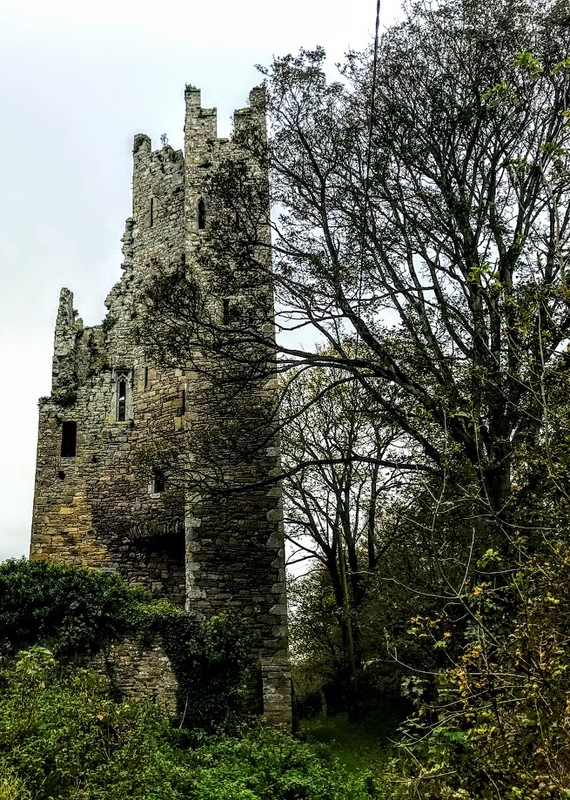 Both men were enthusiastic about Castleconnell, and Peabody was so enamoured with this place on the banks of the River Shannon that he later paid for the iron railings around the local Roman Catholic parish church. 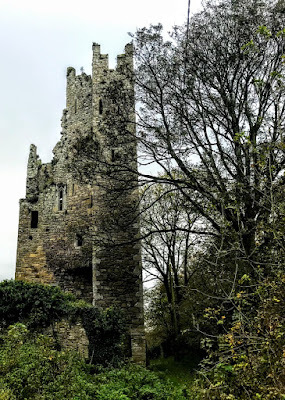 On the way back to Askeaton from Dublin yesterday afternoon, two of us stopped for a late lunch at the Matt the Thresher in Birdhill, and then decided to look for Castleconnell beloved of Bright and Peabody. 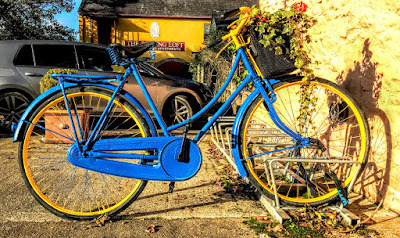 Castleconnell is a scenic village in Co Limerick on the banks of the River Shannon, 11 km outside Limerick city and just a few minutes’ walk from the boundaries where Co Limerick meets Co Clare and Co Tipperary. The castle that gives takes its name to the town is now ruined and once belonged to the Gunning family. The castle, built on a rocky outcrop overlooking the bend on the River Shannon, was besieged and destroyed by General Ginkel’s army during the Jacobite and Williamite wars at the end of the 17th century. 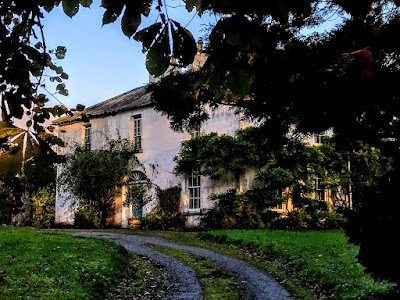 Nearby, Mountshannon House was a Palladian house that was once the home of John FitzGibbon, 1st Earl of Clare, who in the late 18th century was the Attorney-General for Ireland and later Lord Chancellor of Ireland. FitzGibbon was instrumental in pushing through the Act of Union in 1800. The house was inherited by his descendants but was burnt to the ground by the IRA in the 1920s. From the 19th century, Castleconnell was known for its fishing. The main catch was salmon and trout and the Shannon Inn became well known for its fishing clientele over the years. The fortunes of Castleconnell changed considerably in the 1930s when the Shannon Electricity Scheme and the Ardnacrusha dam at Parteen dramatically reduced the flow of water and water levels on the Shannon south of the dam. Castleconnell now gets the first 10 cubic metres per second, Ardnacrusha gets the next 400 and anything left over is sent down the old route. The diversion is done at Parteen Villa Weir, upstream of O’Briensbridge but downstream of Killaloe. 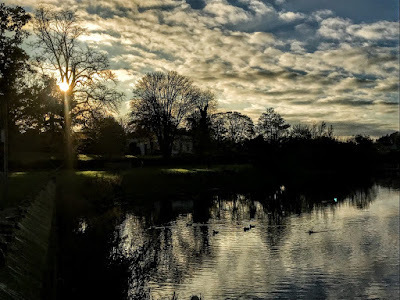 We stopped at Worrall’s End or World’s End, where we found the weir, quay and rowing-club on this stretch of the River Shannon. Castleconnell boat club, founded in 1983, is located here at the upstream end of Castleconnell. At this point, rowers have a smooth, wide water to continue rowing for 3.2 km as far as O’Brien’s Bridge. Just beyond the bridge, rowers have another 1.5 km before coming to a water flow regulator. The name of Worrall’s End or World’s End is said to be a corruption of ‘Worrall’s Inn,’ and was already in use 200 years ago in 1817. The weir is at the same level as it was in the 1840s, so the stretch of river upstream from here, through O’Brien’s Bridge, to Parteen Villa has the same minimum depth as it had and should be just as navigable as it was back then. Famous residents of Castleconnel have included John Bulmer Hobson (1883-1969), a leading member of the Irish Volunteers and the Irish Republican Brotherhood. Bulmer Hobson was born in Belfast and had a fairly strict Quaker upbringing, going to Friends’ School Lisburn. He was sworn into the IRB in Belfast in 1904 by Denis McCullough. Together they founded the Dungannon Clubs, ostensibly to celebrate the victory of Volunteers of 1782 in restoring the Irish Parliament, but also an open front for the IRB. Hobson moved to Dublin in 1907, and soon became a close friend of Tom Clarke. Hobson and Constance Markievicz founded Na Fianna Éireann in 1909. He was appointed to the IRB’s Supreme Council in 1911. He was one of the founding organisers of the Irish Volunteers in 1913. He was a primary connection between the Volunteers and the IRB, and in 1913 he swore Patrick Pearse into the IRB. Hobson was involved in the Howth gunrunning, landing arms from the Asgard at Howth on Sunday, 26 July 1914. Later, on principle, he resigned as a Quaker soon after the 1914 Howth gun-running, as the Quakers are opposed to all forms of violence. As secretary and a member of the Volunteers provisional council, Hobson was instrumental in allowing the Irish Parliamentary leader John Redmond to gain control of the Volunteers in an effort to avoid a split. Hobson remained a member of the IRB, but the chief-of-staff of the Volunteers, Eoin MacNeill, he was kept out of the plans for the Easter Rising in 1916. Hobson was kidnapped by the organisers of the rising to stop him from spreading news of MacNeill’s order countermanding the plans, and he was held at gunpoint in Phibsborough until the Rising was well underway. He retired in 1948, and after a heart attack in the 1960s he lived with his daughter and son-in-law, Camilla and John Mitchell, in Castleconnell. He died there on 8 August 1969, aged 86, and was buried at Gurteen Cemetery near Roundstone, Co Galway. Other residents of Castleconnell have included Marcus Horan, who has played Prop for Munster and Ireland, and Paul Warwick from Australia, who has played at Fly-half, Fullback and Centre for Munster. On Friday afternoon, Google Maps seemed frustrate all our efforts to find the Roman Catholic parish church and the rails donated by Peabody. So instead we went looking for Gardenhill House, and once home to some members of the Comerford family. The house is off the R675, east of Castleconnell, and was originally the home of the Blackall family. 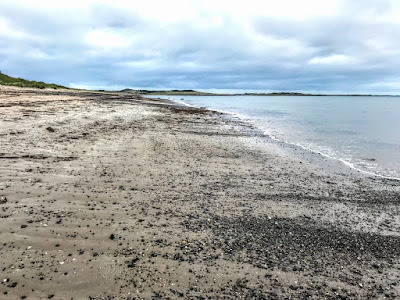 The Blackall family were first granted lands in the Barony of Pubblebrien under the Acts of Settlement, including 800 acres in Ballymartin, Killonahan, Drumloghane, Ballyanraghmore and Dooneen. Two Blackall brothers Charles and George, sons of Thomas Blackall of Killard, Co Clare, married two sisters, Elizabeth and Margery Burnell of Ranaghan, Co Clare in 1772 and 1782. By the early 19th century, the Blackall family had lost most of its landed property due to increasing encumbrances. But Jonas Blackall (1811-1888) of Gardenhill and Limerick City, who entered the legal profession, owned 230 acres in Co Limerick in the 1870s, and Captain NG Blackall held some land at Coolreiry, Castleconnell, in 1906. However, the original Gardenhill House that was a home of the Blackall family, was in ruins by 1840, and the present house dates from after 1840. Owen Comerford was born on 11 December 1869. He was educated, with his brothers Edward Comerford (1864-1942) and James Comerford (1868-1924), at Oscott College, Birmingham (1880-1883). He was a shareholder in Rathdrum Mill. On 8 February 1898, in Saint Michael’s Church, Kingstown (now Dun Laoghaire), Owen Comerford married Kathleen Byrne, daughter of Laurence Byrne of Croney Byrne, Rathdrum. They later lived at ‘Coolas,’ Seafield Road, Clontarf, and he was still living there in 1940. Kathleen died on 17 October 1932. Owen later went to live with his daughter and son-in-law, at Gardenhill House, Castleconnel. This house is a substantial version of the characteristic three-bay two-storey house. Retaining much of its original form, the façade is enlivened by the timber sliding sash windows, limestone sills and slate roof. The ornate doorway adds artistic interest to the façade. The outbuildings add context to the composition and enhance the overall group setting. Owen Comerford died at Gardenhill House, Castleconnell, on 15 June 1945. Owen and Kathleen Comerford were the parents of an only daughter Nora Kathleen (‘Norrie’). In 1940, she married James Henry Montgomery, civic guard, of Chapelizod Garda Barracks, Co Dublin. They later lived at Gardenhill House, Castleconnell. They had no children, and Norrie Montgomery died in 1972. 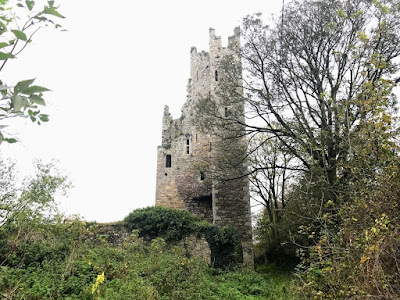 We returned to Castleconnell, but still failed to find the church and Peabody’s rails before we headed back to Askeaton. Today is Ohi Day or Oxi Day (Επέτειος του «'Οχι»), and it is celebrated throughout Greece and Cyprus and by Greek communities around the world on 28 October each year. Ohi Day commemorates the day the Greek Prime minister Ioannis Metaxas rejected the ultimatum from the Italian Fascist dictator Benito Mussolini on 28 October 1940. This day also recalls the Greek counter-attack against invading Italian forces in the mountains of Pindus during World War II, and he Greek Resistance during the occupying Italians and Germans. Mussolini’s ultimatum was presented to Metaxas by the Italian ambassador to Greece, Emanuele Grazzi, around 3 a.m. on the morning of 28 October 1940. Mussolini demanded Greece would allow Axis forces to enter Greek territory and occupy certain unnamed strategic locations – or face war. It is said Metaxas replied with a one-word laconic response: Όχι (No!). In an immediate response to Metaxas’s ‘No’, Italian troops based in Albania attacked the Greek border two hours later at 5.30 a.m. That ‘No!’ brought Greece into World War II on the side of the Allies. Indeed, for a period, Greece was Britain’s only ally against Hitler. Without that ‘No,’ some historians argue, World War II could have lasted much longer. One theory is that had Greece surrendered without any resistance, Hitler could have invaded Russia in the spring, rather than his disastrous attempt to capture it during winter. On this morning 77 years ago, 28 October 1940, Greek people of all political persuasions took to the streets in masses, shouting «'Οχι», ‘No!’ From 1942, this day was celebrated as Ohi Day, first within the resistance and then after the war by all the Greeks. The Battle of Crete and the extra resources required to subdue Greece drained and distracted Nazi Germany from its efforts on other war fronts. Today, Ohi Day is a public holiday in Greece and Cyprus. The events of 1940 are commemorated with military and student parades, public buildings are decorated with Greek flags, there folk dances, and Greek Orthodox churches hold special services. Coastal towns may have naval parades or other celebrations on the seafront. In Thessaloniki, reverence is also paid to the city’s patron, Saint Dimitrios, and the city celebrates its freedom from Turkey. There are traffic delays, especially near parade routes, some streets are blocked off, and most archaeological sites are closed for the day, along with most businesses and services. In Dublin, Ochi Day and the fallen will be marked at 11 a.m. tomorrow morning [Sunday 29 October 2017], during the Divine Liturgy in the Greek Orthodox Church, with the Greek Diplomatic Corps in attendance. This will be followed by a holiday banquet at the Mykonos Restaurant with Irish and Greek music. In the West, politicians are always happy to credit ancient Greece with the development of democracy. But in the present crises in Europe, when Greece is often seen as a burden rather than a partner, it may be worth remembering that Europe owes modern Greece an unacknowledged debt for helping to preserve democracy against the Nazis and Fascists during World War II. Limerick is endowed with an abundant supply of good coffee shops and cafés throughout the city centre. I have enjoyed trying new ones at regular intervals, although the well-known brands and chains also have their merits as ‘pit stops’ on days when I am trying to make haste between one bus connection and the next on the way between Dublin and Limerick. Costa on the corner of Cruise’s Street and O’Connell Street is one of these convenient ‘pit stops’ for much-needed double espressos because it is also close to newsagents where I can stock up reading such as the The Guardian, New Statesman and Private Eye for the next long leg of the journey. But the very name of Cruise’s Street and a plaque on the O’Connell Street façade of Costa are also reminders of an hotel that was torn down in 1991-1992 but that had been a Limerick institution for 200 years. Cruise’s Royal Hotel was founded in 1791 on what was then George Street. In its final days it was one of the finest hotels in Limerick’s City Centre. The 80-room hotel provided a variety of entertainment for local people. The hotel had a presidential suite, and many Presidents and dignitaries who visited Limerick stayed there, including Richard Nixon. In the 19th century, the guests at the hotel had included Daniel O’Connell, Charles Dickens and Charles Stewart Parnell. George Russell was the first proprietor of the hotel when it was built in 1791. It passed through a number of hands before it was bought by the colourful Edward Cruise, who was a personal friend of Daniel O’Connell. In the 1820s, O’Connell conducted his Clare election campaign from Cruise’s Hotel, and later celebrated his victory there. When the Viceroy of Ireland, Lord Mulgrave opened the new Wellesley Bridge in Limerick in 1835, he was feted afterwards at Cruise’s Hotel. The bridge is now known as Sarsfield Bridge. Cruise retired from the business in 1854, but his name continued to be part of the name of the hotel. During his visit to Limerick in 1858, Charles Dickens (1812-1870) stayed at the hotel, which he referred to as the Royal Hotel. He was touring Ireland, visiting Belfast, Dublin and Cork, and in Limerick he was reading on the stages at the Theatre Royal on Henry Street, close to the corner of Mallow Street – a building that was destroyed by fire in 1922. 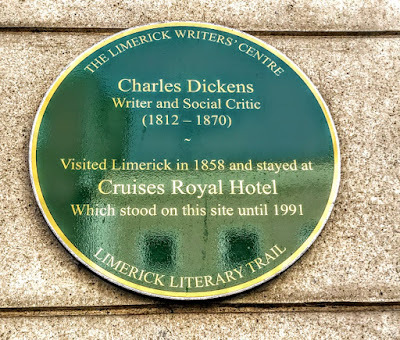 In a letter to his nephew, Dickens described the hotel and his stay in Limerick in September 1858. The Royal Hotel referred to was Cruise’s Royal Hotel on what was then George Street. John Joseph Cleary, who succeeded Edward Cruise as proprietor, made many modern improvements to the hotel, including the introduction of hot baths and showers. He was Mayor of Limerick in 1873 and 1874. From the 1870s and 1880s on, political guests in the hotel included Charles Stewart Parnell, John Redmond and John Dillon. Other guests in the Victorian period included Alfred Lord Tennyson and his son, as they were passing through Limerick on their way to Curragh Chase to visit their friend, the poet Aubrey de Vere and his family. When Edward Cruise, who gave his name to the hotel, died on 25 July 1887, in his 86th year, he was buried in Saint John’s churchyard, Limerick, close to the original proprietor, George Russell. The hotel was demolished in 1991 to make way for Cruise’s Street, a pedestrianised street between O’Connell Street and Chapel Street, and that opened 25 years ago, in late 1992.